Great early Stump Anvil. Came out of a logging camp in Maine. Basically a portable anvil, shop made, that was used on logging sites. Fell a tree, hollow the stump to accept the hardy-esque end and use in on site until you move on. Finished up the Baldor Model 610 – Not typically my style to paint but it was far enough gone that it needed it. 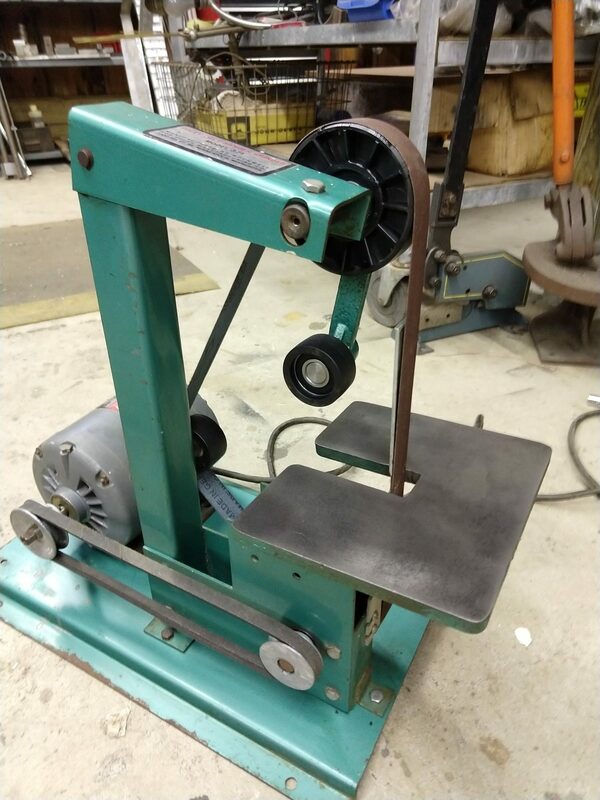 Fun little project – going to start working on cleaning up a older Rockwell Double Carbide Grinder Soon .. actually underway but will post some pics shortly. Kicking around some sculpture….that is all. Found this soldering iron while organizing the shop. Not sure where/when I got it. Must have been an auction box lot. Looked it up and found American Beauty is still going strong. Was able to pickup some replacement tips and set screws (yes, could have got those anywhere but was too easy not to order them with the tips). It heats up great and really gets the job done. Posted a few pics of some initial tinning. Certainly an industrial / production type iron, no bells and whistles, not even a switch. 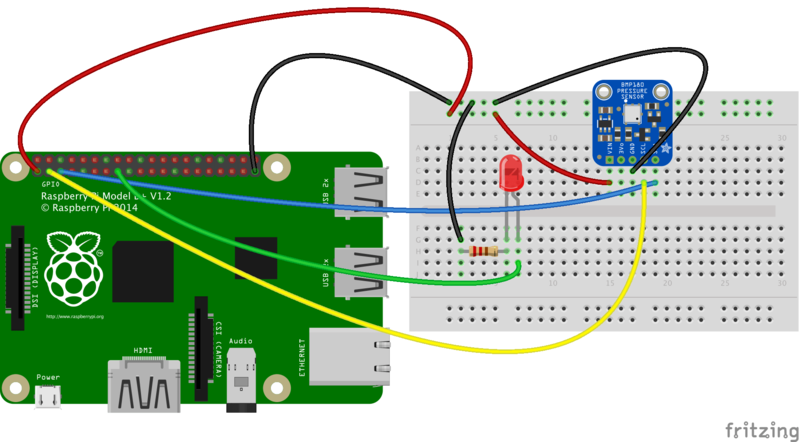 Going to try tinning some thin cable (bicycle – brake and shift). The recent Foley Belt Sander/Grinder went so well I could not help myself. Eyed this one from the roadside at local residence close to home. Been exposed to the weather for almost too long. Plugged her in and she fired right up and in classic Baldor form took 10 minutes to stop spinning after turning off. Was not going to re-paint but now I am in deep so what the heck. Came apart relatively easily (nice to work on quality products). Missing side covers – may have to make some or deal without. Spacer between motor and grinding wheel. Friction fit, simply slide off then remove screws to remove guard assembly. Tool Rest Close up – Bit of an ugly fit for the carriage bolts . Badge Rivets – to remove or not to remove? Ouch – Cracked cast iron guard needs repair. 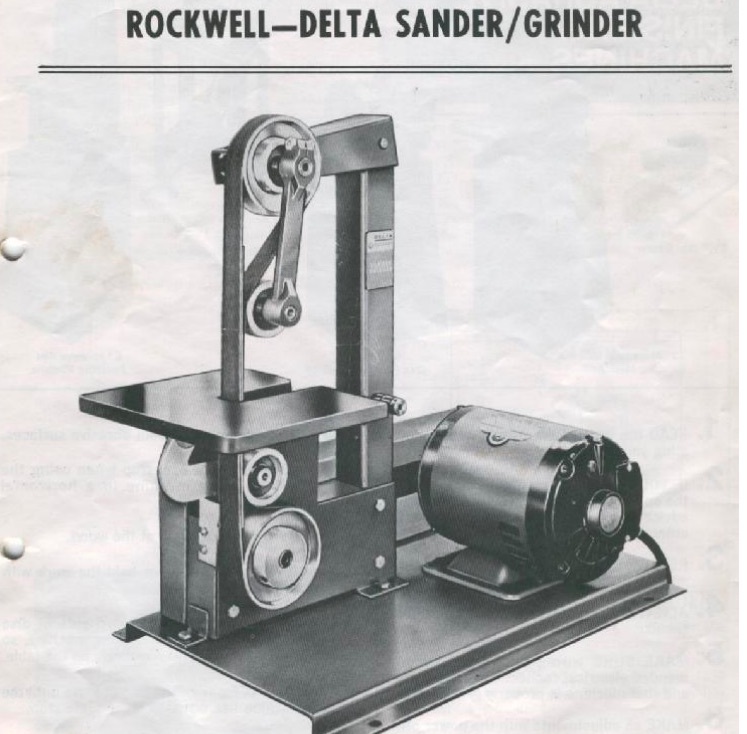 Nifty little 1×42Belt Grinder/Sander made by Rockwell for Foley. It is basically the same as the Rockwell 31-350. Freebie from a barn clean-out (Thanks MB!). Took some scouting around for replacement wheels but alas a shout out to James Liechty (jimliechty@yahoo.com) who has sourced replacement pulleys and other parts for these and offers them at very reasonable prices. Took her apart, cleaned up all the saw dust cake, installed new wheels for sanding belts, replaced one v-belt pulley, replaced the power cord (not done yet) and that was pretty much it. My initial thoughts when it showed up were it was pretty flimsy construction and the plastic wheels made me skeptical but all those thoughts have passed now that it is up and running. Runs great, hit a few pieces of metal with it, no problem. 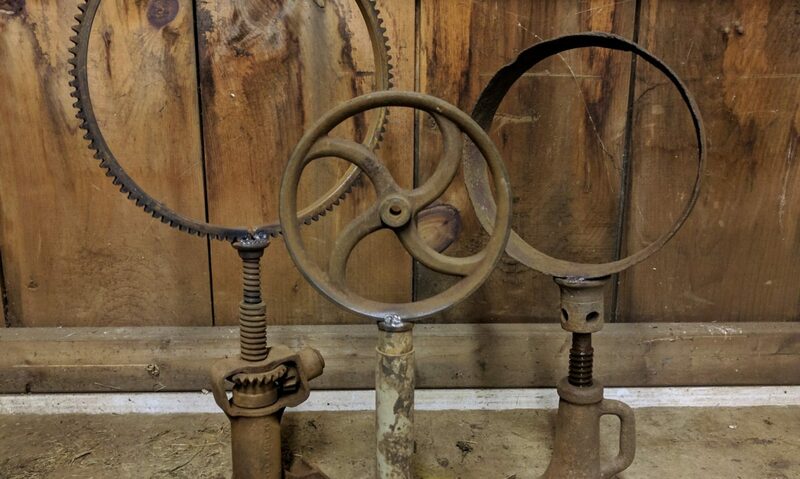 As Found – Note that pulleys are all in place but the rubber coating has rotted off all of them. Complete Pulley Set from Jim! New Top Idler Pulley – shaft cleaned up nice. Messing around on the turret lathe got me re-interested in creating some forming tools. I have watched enough videos to be dangerous and gave it a shot. First tool is pretty crude but I was glad to see it cut as well as it did. Cut shape on mill with tapered end mill and finished up on a grinder. Got cherry red with torch and quenched with water (I know, more work to do studying heat treating – but it cuts). Finish not great but I spend zero time on the honing/sharpening. A few finished cuts on various materials and dimensions. The tandem thing has been bugging me for a while, Jamie’s 650b Conversion, Tom’s custom Ibis “Dumpster Dive” and my high school memories of Pete and I riding Mt. Wachusett and descending “Mile Hill” on a Paramount Tandem loaned from George Gamache. Also bugging me was this Jack Taylor that Wayne has had tucked away at Velo Classique for some time. I recall helping him move it there. Making some minor modification to this Jack Taylor 50th Anniversary Edition tandem to entice the wife to take some leisurely rides on the W&OD or the C&O Canal. Work in progress but addition of wider tires, fresh brake pads, fender removal and addition of riser bar for stocker is looking good. Vintage 35mm Specialized – Not Big Enough! Sans Fenders and Front Rack – Compass 44’s! If the Jack Taylor Retrofit does not work out!